Ancient Chinese Military "Yue Axe II" Ritual Amulet. 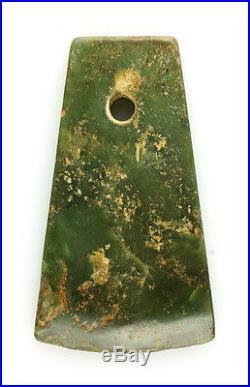 This Neolithic Chinese Jade Symbolic. Battle Axe pendant style dates to approximately the Liangzhu Culture (3500 BC2100 BC) and the. It is made from period correct, opaque, nephrite jade (Yu in Chinese). The Jade stone has a soft-green color that is accented with beautiful russet markings. The entire axe is in museum quality as found condition and is heavily patinated with a wonderful patina that only occurs on worked jade objects buried for thousands of years in the soil. The axe was a common tool in ancient China, but these Jade Axes were for ritual use only and can be found buried with their owners in ancient tombs. The basal edge of the axe is ground and would have been attached to a wooden handle and placed in the tomb. Chinese and Western experts believe these ritual axes denoted military authority when given in ceremony. This example is classified as a Yue-Axe II by the experts. It has a lovely sharpened bit and a single suspension hole that measures about 9.2 mm in diameter and is called a double-bevel hole. It is been drilled with ancient hand drills from both sides of the axe millennia ago. Archaeologists believe this Yue-Ax would have been fastened to a wooden handle, and again, conveyed as a symbol of military authority. Such axes were typically given to a Military General to signify his high social position as a leader and direct arm of the Emperor or Warlord. Ref: JADE, Roger Keverne, pgs. This Jade axe has a bold yet graceful style with a wonderful greenish/orange coloring! The jade surface shows the authentic signs of ancient ground contact discoloration from the original bright green jade to a reddish/orange from the iron in the soil. After thousands of years in damp soil, the iron in the soil leaches into the semi-porous jade and turns it orange or red. This Yu Axe has highlight streaks of russet-orange in parts. Neolithic Yue Battle Axe dates to 3500 - 2100 BCE. Green and reddish Orange Jade. 5" Length x 3" Width x 1/2 Height. __________________________________________________ Jackson's On Main sells high quality art and antiquities at excellent prices from both our extensive collection and from the private collections of our clients and various estates. Jackson's On Main History. Our business was established in 1966 by Claude and William Jackson, father and son, in Hollywood, California. Claude Jackson (now deceased) was a well known West Coast artist who executed numerous fine works many depicting the great movie stars of early Hollywood. Several of his works have been published and those originals now reside in the collections of various noted individuals and institutions. Most notable probably is his depiction of Marilyn Monroe in his'Red Kimono', 1975, published as the centerfold in Roger Taylor's anthology. As time passed we diversified and grew and now we maintain a 3,000 square foot full service walk-in art and antique Gallery in Mt. We are fully staffed and equipped to provide prompt professional service and we guarantee ALL sales to be as described. We also are always interested in purchasing quality art works and we pay top dollar. Please send pictures for quotes. We guarantee your full satisfaction with every sale. Bill and Donna Jackson Owners. Color of item may deviate slightly in comparison to the original item due to differences in computer monitors and lighting conditions. Please read description of color. The item "ANCIENT CHINESE MILITARY RITUAL JADE YUE AXE LIANGZHU CULTURE 3500-2100 BCE" is in sale since Monday, August 3, 2015. This item is in the category "Antiques\Asian Antiques\China\Armor". The seller is "jacksonsonmain" and is located in Mount Sterling, Kentucky. This item can be shipped worldwide.